Stir-fried gaobak, a kind of young shoots, is surprisingly tasty. If you ever see this veg in your local Asian grocers, don't walk on by. 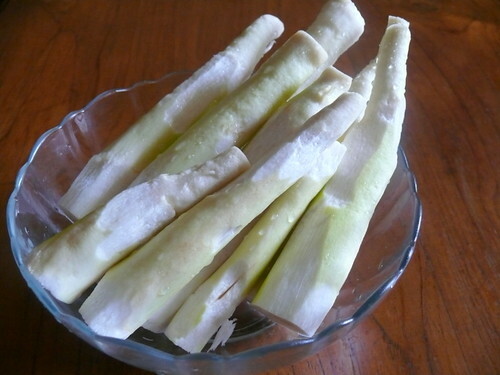 This is gaobak, a spring shoot from China that looks like young corn in their husks, only gaobak is bigger, about 25 cm (1 ft) long. My in-laws love gaobak and I bring them back when I find them in Shanghainese grocers in Hong Kong. Gaobak in their husks. Choose the shoots that are round and swollen, not the flat ones. Feel along the stem to the tip. The stem should extend to the tip, not halfway or you'll be paying mostly for the husks. These gaobak were RM12.90/kg (US$4), not cheap since half of them are husks. Peel the husks away to reveal the shoots. 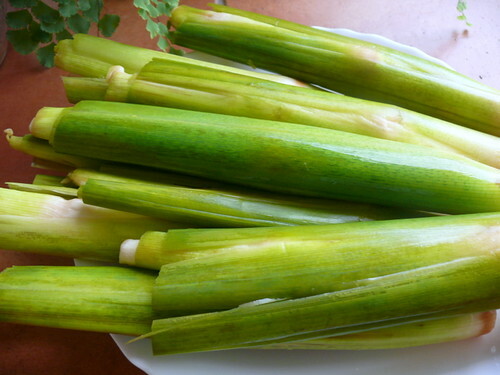 Cut off the hard lower stems and peel them for a more tender bite. My MIL came across gaobak at Servay Supermarket in Likas last week (very rare, first time) and cooked gaobak and belly pork stew. My son Wey ate all the belly pork and left us with the gaobak, which was fine because we enjoy the soft crunch and the very delicate flavor which I can only describe as close to young baby corn again. MIL said that gaobak can be fried with garlic and light soy sauce too and I remember a travel episode on Shanghai I saw years ago where this guy stir-fried a plate of gaobak using Maggi soy sauce, a surprise for me because I didn't know they have Maggi sauce in China. I love Maggi sauce even though I know it's probably seasoned with msg. Maybe they know I always keep a big bottle on the shelf and that's why they invite me to their products launches. The bummer about getting invites to food products launches and restaurant food tasting is I live in KK. They forget that I can't drive to KL or Singapore. I was going to cook this plate of fried gaobak with belly pork but it was so tasty, I couldn't wait. Next time. *Peel away the green outer 'husks' or leaves of the gaobak, cutting off the hard stems and peel the young white stems if necessary. You can cut them into thick strips (easier on old folks) or into chunks like I did. Put the oil into a heat wok (Shanghainese use quite a bit of oil and sugar in their cooking), add the garlic and stir for a couple of seconds. Add the gaobak, stir under medium heat for a minute and add the soy sauce and sugar. Stir, then add the water and cover. Once in a while, take off the lid and stir and repeat. The frying takes about 3-4 minutes. Do not overcook. 1. Fry the gao bak as above and leave it aside for later. 2. Heat up a pot or use the same wok and fry the pork belly in a little oil and add 3-4 T light soy sauce (try Yummy Brand). If you want a darker sauce, add 1-2 T dark soy sauce. When pork tightens and shrinks, add the sugar, fry, and add 1/2 cup of water and the wine and simmer, covered. Once in a while, stir the pork. Taste and add more light soy sauce if necessary. Add some chicken stock powder if like. 3. When the pork is fork-tender, scoop it into a bowl leaving the sauce behind to simmer and thicken. Add the pork back in and then add the fried gaobak, heat through and serve hot with plain rice. Note: the pork is taken out and the gaobak added later so that the texture, taste and flavor of the pork'll not be coarse/diluted. Hub and I 'll be flying off to London in 2 weeks, making a 2-day stopover in Dubai. I'd love to get some tips and advice on hotels and eating places in Dubai, London and Europe! update: check here for flower buns. It's very very hot (35 C!) and humid recently, perfect weather for making bread and anything that needs to be leavened, and so I made mantou. In my post on Chinese buns (baos), a couple of readers commented that the dough was dry and the baos turned hard after they cooled. 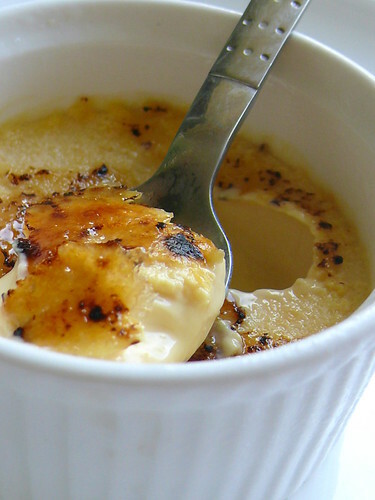 That bothered me because only true and tried recipes make it to this blog. I too found that the dough according to my recipe was very dry and I had to add extra water to get a smooth dough. I checked the original recipe and found that the amount of water given was in grams, not ml and I had scribbled the equivalent of 120 ml next to the 100 gm of water, as informed by the chef I learnt the recipe from. Could that be wrong? It was. 100 g of water is about 140 ml when I measured it on my scale and in a jug (as pointed out correctly by a reader, 1 g (pure) water at a warm room temp equals 1 ml--which I've always used in conversion for my cooking but not for this recipe since the chef instructed that the ml measurement is higher--but I used a non-digital kitchen scale so this amount is distorted. Whatever, the amount of water should be about 180 to 200 ml). On top of that, the original recipe used 100 gm of steamed sweet potatoes which had water and we were told that we can substitute the steamed potato with the same amount of flour. But then how did I make the baos in the photo? I can't remember, but I must've measured the water by weight and added extra water and forgot to note it on my posted recipe. In any case, I have amended the recipe for this post according to my latest attempt. Sorry for the mistake! This story originates from the Three Kingdoms Period, when the strategist Zhuge Liang led the Shu Army in an invasion of the southern lands (roughly modern-day Yunnan and northern Burma). After subduing the barbarian king Meng Huo, Zhuge Liang led the army back to Shu, but met a swift-flowing river which defied all attempts to cross it. A barbarian lord informed him that, in olden days, the barbarians would sacrifice 50 men and throw their heads into the river to appease the river spirit and allow them to cross; Zhuge Liang, however, did not want to cause any more bloodshed, and instead killed the cows and horses the army brought along and filled their meat into buns shaped roughly like human heads - round with a flat base - to be made and then thrown into the river. After a successful crossing he named the buns "barbarian's head" (mántóu, 蠻頭), which evolved into the present day mántóu (饅頭). Most mantou are Northern Chinese in origin since wheat is the staple food of the northern Chinese. The famous cha shau bao you eat at dim sum restaurants however is Southern Chinese. Flower rolls (hua juan) are mantou (buns) without fillings, to be eaten with meat stews and saucy dishes. The dough is cut into thin strips, and rolled and twisted into spiral mounds. Ying xi juan or silver thread buns (Chinese food and dishes often have very fanciful descriptive names) are also unfilled mantou and they are called such because inside the long bun are thin dough strips which with a bit of imagination and poetic flair look like silver threads. While my mantou turned out very light and soft, a lot of improvement is needed to shape the flower rolls and silver thread rolls. I didn't cut the dough strips through or brush them with oil and when the flower rolls proofed, the dough strips fused together. I did lightly oil the dough strips for the silver thread buns but on the upper surface only. The strips have to be well-oiled all around for them not to fuse together during proofing and steaming. I'm also not too sure how the rolls should be shaped because it's been a long time since I ate authentic flower rolls. I'll get some idea of the real thing this October when we visit Shanghai for the Expo. These mantou stayed soft even after they cooled. 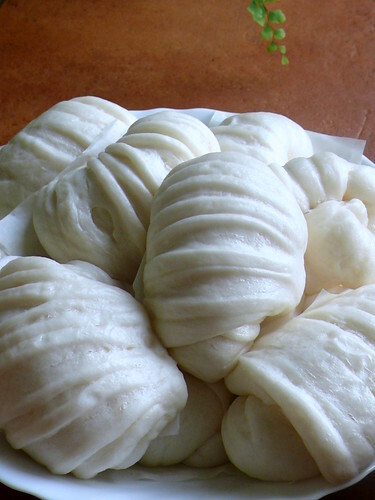 Mantou are usually left in the steamer and eaten hot. I used bao flour and the mantou turned out soft, light, fine-textured and pure white, like commercial baos. You can use plain flour too and although the mantou aren't as fine-textured or white, they taste just as good. Snow-white mantao are beautiful but too bleached for me. Like bread making, mantou are fun to make, especially if they turn out well. This is a fail-proof recipe now. I challenge you to try it. *If you use 250 ml and you are kneading by hand, add 200 ml first and knead in the remainder slowly, 10 to 15 ml each time, so that the dough is not too sticky to handle. Depending on the type of flour you use, you may not need all the water. 3. For flower rolls: Divide dough into 50g portions & roll into smooth balls without using flour. Only if the dough is way too sticky, dust your hands and the work surface lightly with some flour. Flatten each ball, roll into a small rectangle as long as your hand (fingers n palm) and about 4 cm wide. 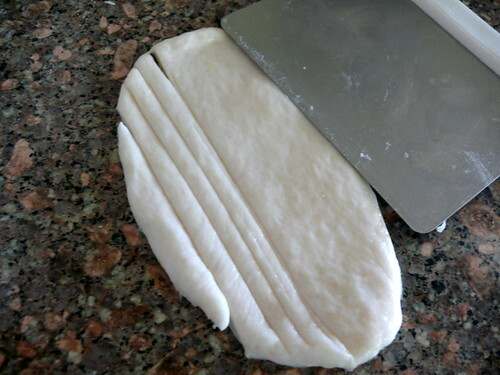 Use a metal pastry cutter and cut the dough into strips. Brush veg oil all over the surface of the strips. Take the ends of the dough, one in each hand, and twist into a pretty roll. I've seen some photos of flower rolls that are twisted in and out, very pretty. Place the roll on a small square of baking paper, about 6 cm square. Let the rolls proof for 30-45 minutes or until doubled. Do not overproof or rolls will wrinkle when steamed. Steam at high heat for 5 minutes in a bamboo steamer. Serve hot. For silver thread rolls: Roll a piece of dough about the length of your palm and about 1/3 cm thick. Cut into strips about the size of udon noodles with metal cutter and brush veg oil generously on both sides. Roll out a large thin piece of dough 'skin'. Lift half the strips, holding each end in each of your hands and stretch slightly, then place onto the center of the 'skin'. Lift the remaining strips, stretch and lay on top of the first strips and fold the sides of the skin over, pinching the ends to seal well. Lay the long roll on baking paper and let proof for 30-45 minutes or until doubled. Steam for 8 minutes. When cool, slice crosswise into 4 cm-thick sections. Serve hot with meat dishes. For filled baos: Divide the dough into 50g (small) or 70 g (large) pieces. Roll each into a ball, then flatten into a circle, fill with your choice of filling (savory or sweet), seal the baos (pleated for savory n smooth top for plain), let it rise until doubled n steam about 6-8 minutes. If the filling is uncooked meat, steam for 12-15 minutes. Note: Mantou can be re-heated by steaming. 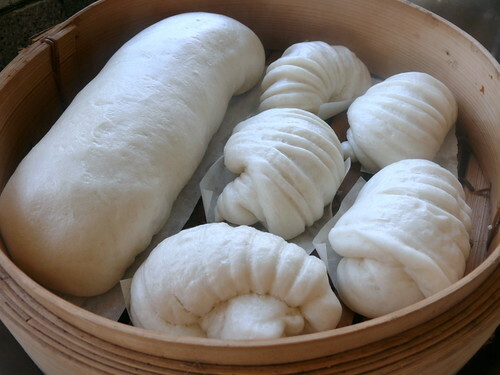 A bamboo steamer is best for steaming mantou because the gaps in the steamer let the steam out so that the steam won't condense on the mantou and damage their appearance. I've seen Chinese cabbages on rooftops, on the ground, on sidewalks and nearly everywhere in China, especially in the mid to northern parts of China. Never saw them anywhere in Napa Valley so I wonder why they call them Napa cabbages in the States.They got them right in Australia, almost. Chinese cabbages are "wong nga bak" in the Cantonese dialect, so the cabbages should be "wongbak" and not "wongbok". Chinese cabbages are versatile because they can be fried plain or with other ingredients, chopped & wrapped in jiaozi, pickled in salt and vinegar or kim chi-style, boiled in soups and stews and when you run out of ideas, steamed. 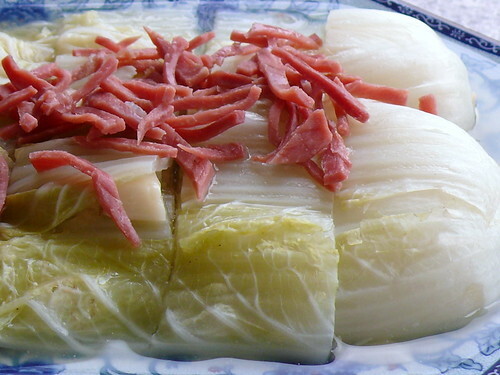 Steamed Chinese cabbage can taste rather bland but is refreshing if the meal is rich and heavy. You can cut the cabbage up before steaming. It'll cook faster but it's a neater presentation if you serve a whole cabbage and cut it just before serving. Make sure you get the smaller cabbages or you'll have too much cabbage to chew. Australian wongboks are as big as watermelons while typical Chinese cabbages are slimmer. You can add a topping of Chinese ham strips (I'm only using the ham to brighten up the photos) or fried shallots but unadorned is just as good. This dish is meant to be light so season very lightly with salt or leave the salt out. Never add oil. 1. Wash the cabbage without beaking off the leaves. Drain well by shaking off the water. Put cabbage on a heat-proof plate and stuff the smashed garlic in between the leaves (sprinkle some salt over if like) and steam in medium high heat for about 30 minutes, depending on the texture you want. Most people like it real soft. 2. 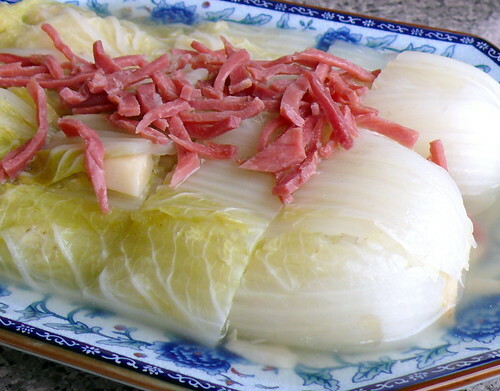 If you prefer a thicker and tastier sauce, pour away all the liquid from the steamed cabbage. Put the chicken broth + cornstarch to boil, stirring well until thickened. Don't make the sauce gluey thick. It should be slightly thick. Add the steamed ham if using. Pour the sauce over the steamed cabbage and serve. Or just top with crispy shallots, or leave plain. 3. Cut into neat smaller pieces just before serving. 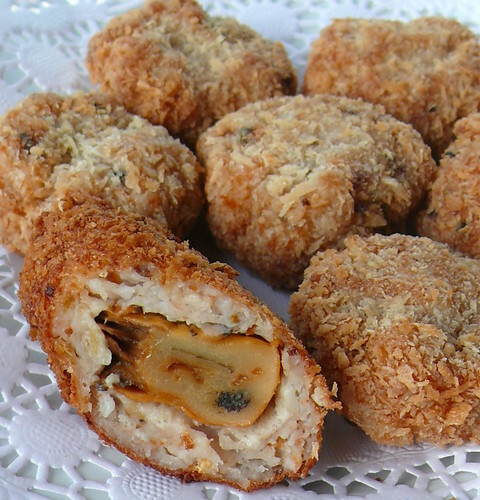 Dried oyster patties and one whole meat-wrapped oyster. At an exquisitely prepared birthday banquet last week, one of the hot appetizers (as against cold) was small fish patties with minced dried oysters. The flavor of the dried oysters reminded me that this Chinese ingredient seem to be overlooked in recent years, restricted to congee, winter melon soups and CNY fa cai stew only. Chinese dried oysters add a distinctive flavor, which may be too fishy for some people, and savory sweetness to any dish. The big plump greenish-brown oysters skewered on a bamboo stick are the best. The lighter the color, the fresher the dried oysters are, to my experience. These oysters cost quite a bit, about RM180/kg (US$50/kg ) and I had to get them in Hong Kong. One oyster dish I'll never forget was my dad's experiment with wrapping stewed dried oysters, Chinese mushrooms and I don't remember what else in pieces of transparent membrane with a network of fat called pig omentum. I don't remember eating it because I thought it was absolutely gross. That was before I love food. Now I would eat it. I just googled and found out that omentum is a fatty membrane that wraps around your intestines and stomach. So if you have a big belly, you'll have a large piece of omentum. Like the pig. Instead of fish paste, I used minced pork, minced prawns, a couple of water chestnuts and dried oysters for these patties. I thought they were pretty tasty and the dried oysters give a wonderful flavor. I also experimented by wrapping the meat paste around a steamed dried oyster that was seasoned with wine and salt. While the minced dried oysters patties were tasty, the meat-paste wrapped whole dried oyster was definitely more decadent and satisfying especially if you like dried oysters. 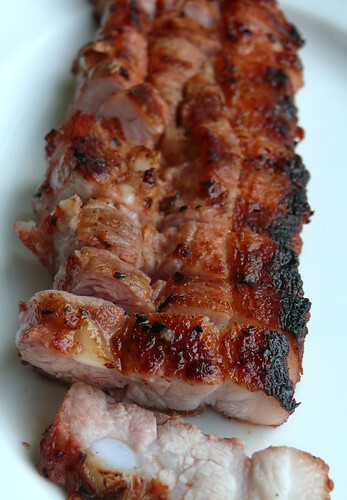 *the pork can be fully lean or with some fat. Hint: Fat always makes food taste better. You can also use ready-minced pork but you'll have to reduce the salt. 1. Mince the pork until very fine. Same with the prawns and the dried oysters. Using the flat blade of your cleaver, smash the meat and the prawns bit by bit separately into a paste. 2 Mix the meat, prawns, dried oysters, water chestnuts, salt & pepper and stir vigorously in circles until the paste becomes sticky and stiff. 3. Divide the meat mixture into small portions of about one tablespoon each. Drop into the breadcrumbs, press it down and shape into small rounds. Chill for 20 minutes for easier handling. 4. Heat 1/2 cup oil in a small pan and shallow-fry the patties, turning over once. 5. 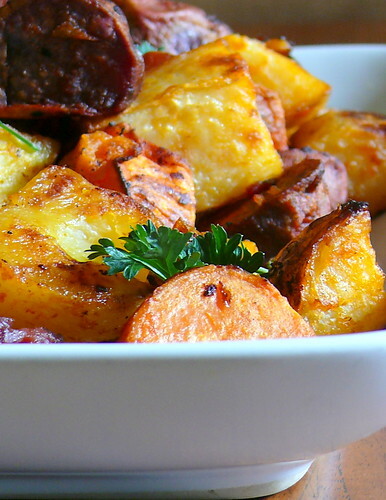 Serve hot with wedges of lemon and mustard sauce. I just realized I'm posting two Korean recipes in a row. Everytime I watch Korean dramas, I want to eat kim chi, seaweed soup and samgyubsal. And by the 20th episode, I find myself talking in a higher pitch, getting more animated than usual. I even have thoughts of being grabbed by my wrist suddenly by Hub who is saving me from someone, and we start running. Or if I'm particularly difficult, he grabs my legs and slings me over his strong shoulders and strides off, me pounding his back. If I've been bullied and offended, I say something like "Buoya!" and slap the offender on the face. If I'm really mad, I throw a glass of water into her face. If I was the offender, I would kneel and grab the legs of the person I want forgiveness from, walking on my knees after him/her. If you watch Korean dramas with me, and you enjoy these scenes, you'd hate having me around because I usually watch them on the floor. There's more space to roll. 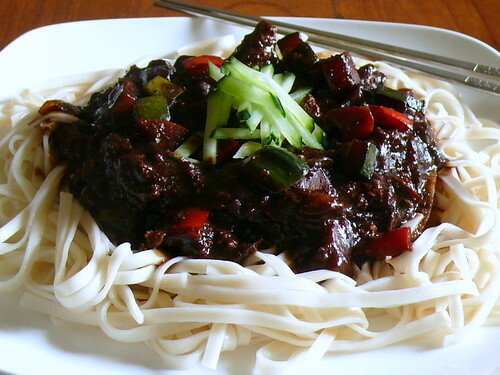 Jja jang myun is the Korean version of the northern Chinese jja jiang mein, meaning deep-fried sauce noodles. The biggest difference between the two versions is that the Korean jang is black in color (because of the black bean and soy sauce) while the Chinese jiang is brown in color because brown bean paste is used. 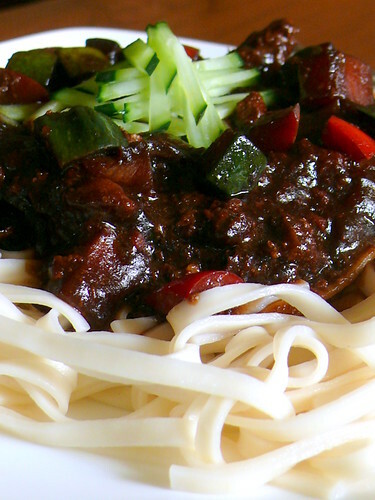 If you ask my (un)biased opinion, Chinese ja jiang mein tastes better because brown bean sauce is more fragrant and it is less threatening-looking than the tar-colored Korean jang which has a slight caramelized flavor. Although Chinese jang is the authentic version, like the Japanese gyoza which is really Chinese jiaozi or potstickers, Korean ja jang myun is more well-known. The irony is that jja jang myun was adapted for Korean taste by Chinese restauranteurs. 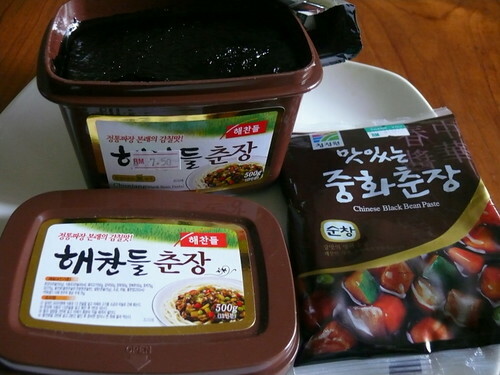 Korean-style Chinese black bean sauce is 'chunjang' (not doejang) and is very black and thick. This is a super easy and inexpensive dish to prepare. You can do the sauce days earlier. There's meat, veggies and starch so it's a complete meal. I don't like potatoes in my ja jang sauce but it's up to you. Add enough veg so that the sauce is not too salty. Great dish for students who are sick of pizzas. 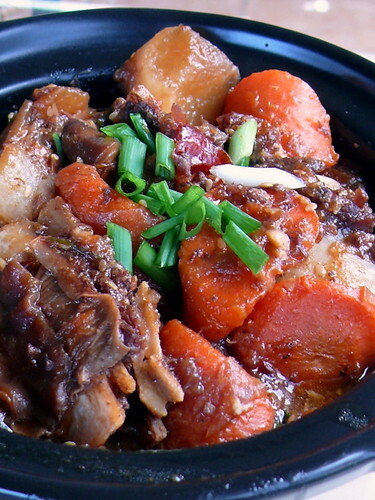 * Pork is the traditional meat for this dish and is usually cut into cubes. I've used coarsely ground minced pork since I'm cooking extra for my in-laws and my mom. 1. Cut the veggies into small cubes. Put the oil into a heated pot and fry the onions until they become transparent. Add the meat and stir-fry until it has turned white. 2. Add the black bean sauce, stirring well. Add the harder -o-cook veg such as carrots and potatoes. Stir, add the stock/water and put the lid on. 3. Add the veggies according to their cooking time, adding the veg that cooks fastest last. I usually under-cook the veg because they continue cooking in the pot after the heat is off. Taste and add more bean sauce if necessary. Add the sugar to taste. Thicken the sauce with the corn starch mixed with the water. 4. Boil the noodles until el dente, drain well and serve the sauce on top with the cuke strips for garnish. Drizzle some sesame oil over if like. Isn't that a pretty plate of veggies? 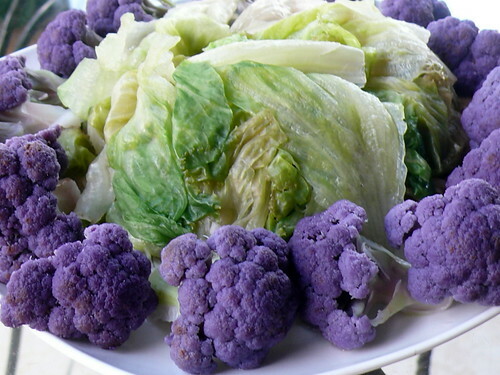 The lettuce looked like they were boiled to death but still, who would've thought, a plate of lettuce surrounded by purple cauliflower? I told Vero she did a good job and she dismissed it humbly. When the weather's cool and rainy, I like dishes that warm the body. 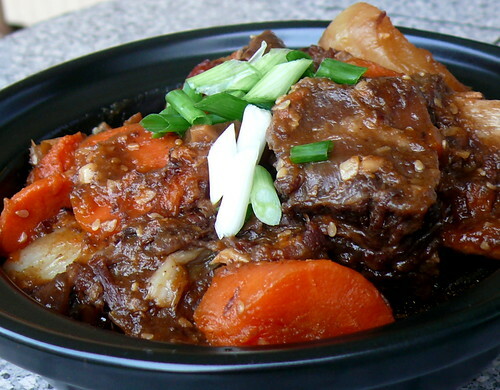 Stews do a great job warning up the body and stomach. The funny thing about kalbi jim is, the few times I cooked it, that it was either too watery and or too dry or too bland but this time, when I didn't bother to follow the cookbook, it turned out perfect. I found that with the pressure cooker, my stews turn out better when I get the meat half-way tender and then switch the fire off so that the sauce can seep into the meat while the meat continue to cook in the retained heat. After some time, I re-heat and let it cook without pressure to reduce and thicken the sauce. If I use the pressure cooker all through the cooking process, the stew doesn't turn out as flavorful. You can cook a good stew with the pressure cooker but by combining pressure and non-pressure simmering, your stew can be better than just good. Instead of marinading the ribs, I cooked them until half-tender and then added the seasoning ingredients. The family gave high marks for this, and I'm happy. 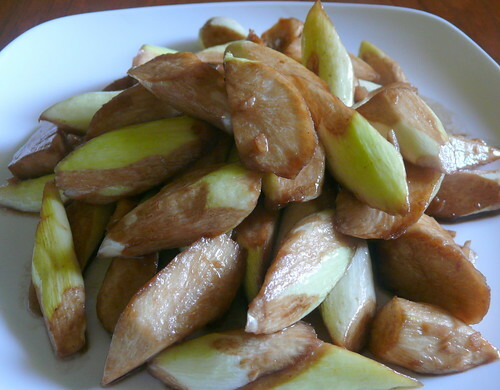 *in Korean cooking, pear or pineapple juice is often added to tenderize the meat. I used the stem/heart of a fresh pineapple, because we had a fresh pineapple. 1. Trim the rib of any fat, wash well. Blanch the ribs with plenty of boiling water, drain. 2. Put ribs into a pressure cooker and add enough water to just cover and cook about 20 minutes after the pressure is reached. Turn heat off. 3. When the safety button drops, remove the lid and add all the remaining ingredients except a large pinch of chopped spring onions for garnish. Cover and simmer at normal cooking heat without pressure for about 20 minutes. If there's too much liquid, leave the lid half-on, turn the heat to high and cook so that somw of the liquid is reduced. Cover and turn heat off. 4. After 20 minutes, re-heat the stew and let it cook under pressure for another 10-15 minutes depending on how tender the meat is. Let the stew steep in the sauce until just before serving time. Re-heat, taste & season if necessary.The sauce shouldn't be too thin. If it is, leave the lid open and cook the stew at high heat to burn off some of the sauce to thicken it. Sprinkle the reserved spring onions over the stew and serve hot with rice. Nam yue, euphemistically referred to as Chinese cheese, are little 2 cm squares of soy beans paste fermented in wine, salt, spices, chili flakes and red rice yeast. 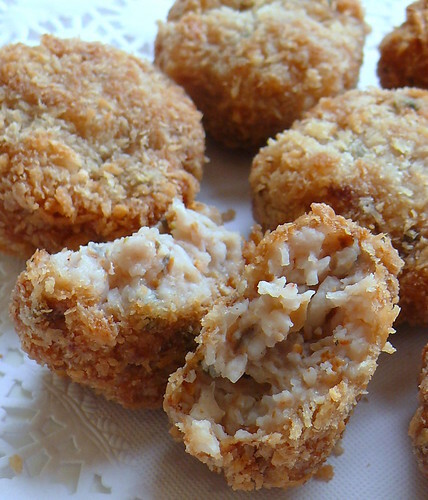 The fermented bean cubes have a creamy, soft cheese-like texture, are very salty and are used as a cooking condiment. 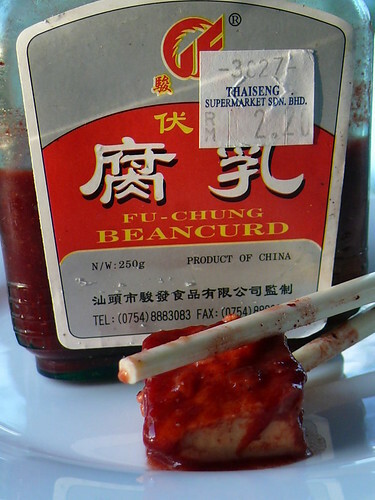 Beyond the saltiness, you will taste wine, 5-spice powder and the distinctive flavor of fermented soy bean curd. Soy bean cubes fermented without the red yeast are creamy colored, called fu yue, and these are milder in flavor but that depends on where they are made, because some can still be quite pungent. The best fu yue & nam yue come from Guilin, China. Fu yue is usually eaten with congee (a broth of rice and water, cooked until the rice becomes a thin gruel) or fried with greens, giving a creamy, tasty sauce to the dish while nam yue is often used to flavor stewed meat dishes. If I had to choose, I'd pick nam yue as one of the best Chinese cooking ingredients. Under-rated and over looked, nam yue is intensely flavored and the fermented bean curd gives a savory-sweet taste into any dish, especially stewed meat dishes. Hakka koe yuk (belly pork slices with taro) cannot be made without generous amounts of nam yue. A good hum jim bang (a big circle of Chinese fried dough) should have some nam yue in it, as does nam yue spare ribs, nam yue pork stewed with wood ears or bamboo and nam yue-flavored snacks. After my jin dui experience two weeks ago, I'm turned off by anything deep fried. 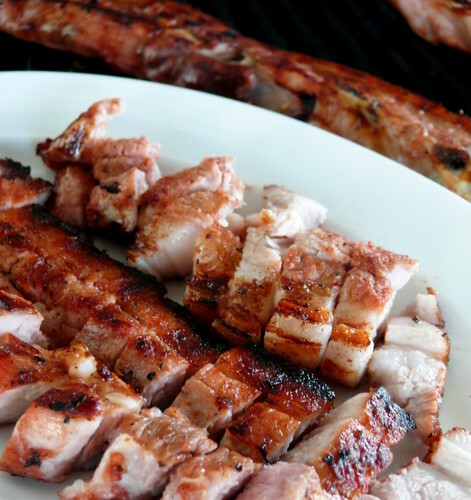 Deep fried nam yue pork is one of the best dishes to die for, especially if you wash it down with wine or beer. Instead of deep-frying, I decided to cook nam yue-marinaded pork on my bbq grill, like how cha sao is roasted. The result is a highly flavored piece of pork that when sliced into thin pieces, goes beautifully with white rice and some stir-fried greens. I suppose you can use chicken or even lamb but pork is the best meat, and belly pork the best cut (because of the fat), for this recipe. 1. Mix everything together, rubbing and massaging the marinade into the meat, and leave covered in the fridge for overnight or at least 8 hours. The longer the meat is marinaded, the deeper the flavor. 2. Heat up the barbie, turn fire to low and grill the pork slowly (hood down) until cooked, about 30 minutes. 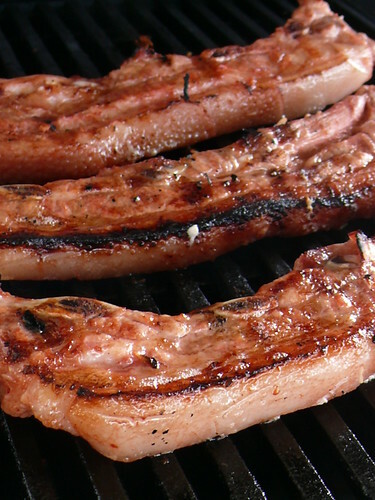 Once in a while, brush the pork with the marinade liquid. Serve hot. I've been sick for the past 2 weeks. It was all because of the jin dui. I ate one straight out of the wok, burning my mouth and throat. Like the seagull that ate the toasted marshmallow (which glued his beak) I threw it one day a long time ago in Canada, I flipped my eyes but stubbornly swallowed the steaming hot glutinous ball down my poor gullet. The next few days my throat felt sore but I thought it'd go away. I avoid going to doctors here because they both treat and dispense meds and routinely subscribe antibiotics for everything. A week later I couldn't swallow and was weak from fever, my throat so badly infected I couldn't eat or sleep. I started taking meds last wed and am recovering. I hardly ever get sick, thank God, and this reminds me again how good life is when everything is fine and normal. 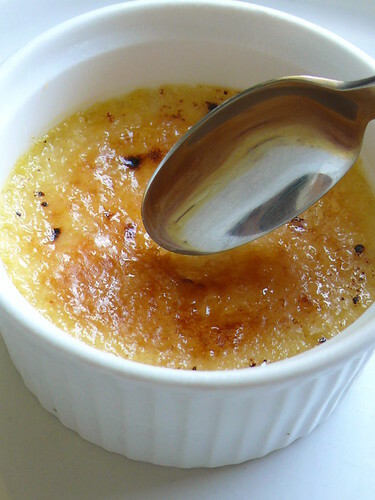 This recipe is straight off BBC GoodFood's current post. Wey doesn't seem to be growing upwards and I blame it on too much white rice, which he loves, and too little veg, which he hates. What a growing boy needs to eat is spuds, which have more vitamins and minerals than white rice. My friend X has very tall kids and she thinks it's the potatoes. "They never eat rice," she says in a way that rice is inferior. Strange, since they are Chinese. Well. I'm desperately feeding Wey more veg and potatoes before his growth 'window period' (a term everybody seems to be using, causing me panic) closes. The last week we've had more potatoes and pasta than we had rice. Heck, maybe I'll grow taller too. I liked this, mainly because I love potatoes and tomatoes. You can use a mixture of potatoes and sweet potatoes like I did (pulled from my garden, planted by Vero) or all potatoes. I left the skins on, for the minerals and fiber. And for sheer savings, do you realize how much peelings are unecessarily thrown away? I'm serving it with roasted chicken tonight but fish or lamb would be good too. And don't forget some fresh crisp greens. Again, simple is best. 1. Oven at 180 C, fan on. As preferred, you can have the pototoes peeled or unpeeled. 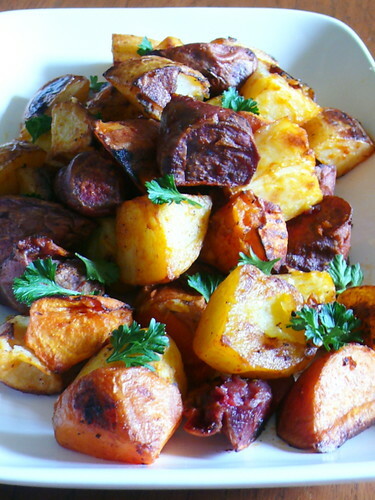 Put potatoes into a bowl and mix them with 3 T oil, garlic, tomato puree & paprika. 2. Drizzle oil on baking tray and scatter potatoes on tray. Sprinkle salt & pepper over and roast 30 minutes or longer for larger chunks.Turn the potatoes halfway through. Sprinkle the lemon juice and parsley and roast another 5 minutes. Serve hot. I'll let this video clip speak for itself. Really, what kind of a person says such things? And since he openly says it, I openly post it too. If 1Malaysia is not just a show campaign, then stop people who are racists and extremists. So far it looks like it's just another campaign, all show and no action.